This is an incredible, memoir-style, encouraging book. Written together by Ken and Joni Tada, it encompasses many years of their amazing life together. If you thought marriage was tough, be ready for a reality check for in these pages you will be acquainted again and again with tragedies that threaten to sink all those in its wake. Joni’s life has always been anything but normal so why should her marriage be any different? From the time they started dating, Ken and Joni both knew it would be difficult. They knew it would be hectic. They knew it would be overwhelming. They also knew it would be worth it. Their story makes Jesus seem so close and so personal. It is precious. It is priceless. This book will put things in perspective, and offer hope. It will challenge you to a closer walk with the Lord. A must read! I was greatly helped and convicted by this book. It talks about the greatest sin, pride, and how it affects even the “best” Christians. 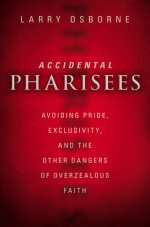 The author warns Christians against comparing themselves to others, and “accidentally” believing they are somehow better. – It’s not up to us to make sure everyone else fits our definition of following Christ. – We need to learn to be kind, and practice grace with our fellow believers, instead of judging every little mistake! Does God do that to us? No. He is so merciful, and we are so unworthy. – We are all made differently. On purpose. By our Creator. He has given us different gifts, abilities and desires. He wants us to do different thing. We are all members of one body, but we are different parts. Just because a fellow church member doesn’t share my passion for one area of ministry, does not mean he is a lesser Christian. I would greatly recommend this book. It’s a very powerful wake-up call to help us truly follow Christ, and not become a Pharisee, accidentally. This story begins as a heart-wrenching tragedy and ends with hope. In March, 2010, the Storch family was on a skiing vacation when 13-year-old Taylor had a horrible skiing accident that ended her life. As the family grieved, they made the life-changing decision to donate her organs. This story follows four other families and their battles with different diseases and health problems. When Taylor’s organs were donated, these families got new life! When the accident takes place, the grief is completely overwhelming to say the least. Tara, the mother couldn’t eat for several days. She sobbed and vomited…for days. Even after several days, she would awaken screaming for her daughter. This went on around the clock for weeks. Friends and family were there 24/7 to care for her, Todd (Taylor’s dad), and the other children, Ryan and Peyton. I couldn’t stop the tears either as I read through these chapters. I cannot imagine feeling like 1/5 of me was forever gone. Todd worked through his grief by getting busy. He helped to organize a memorial for Taylor at her middle school. But the biggest thing was starting Taylor’s Gift, a foundation started to increase awareness of organ donation. This foundation helps to link people to their own state, and to learn how they can register to be an organ donor. 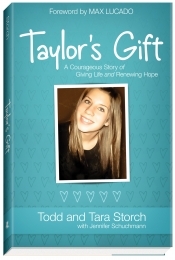 The website Taylor’s Gift has a lot of pictures, products to buy, and stories about others who have benefited from organ donation. Click here to see when the Storches met Patricia, the precious lady who received Taylor’s heart. Through this foundation, the Storch family found a new purpose and a new hope. The book definitely did its job. Taylor will never be forgotten, and I am forever aware of the beautiful gift of her organs, that her death brought forth. A great book… but only if you feel like crying. Available April 2013 at your favorite bookseller from Revell, a division of Baker Publishing Group.